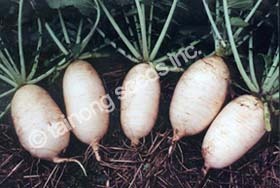 Radish 羅蔔 | Tainong Seeds Inc.
New F1 Hybrid Radish variety with all white root, 14~16 inches long ~3 inches thick. Good taste, excellent for soup. 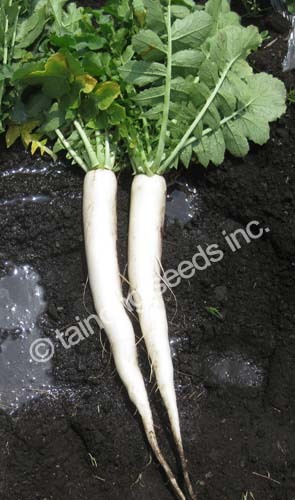 F1 Radish for spring/autumn sowing, with very strong tolerance to cold & extra late bolting characteristic. 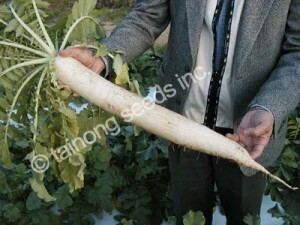 All white, tapered root, 14~16 inches long ~2.5 inches thick. 8~10 inches long and 5~6 inches in diameter. ~10 inches long and 2~3 inches in diameter. Medium green tops with white tips. 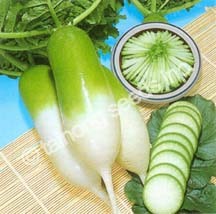 Excellent for pickling and salads. Extra slow bolting and late pithiness. Ready in ~60 days. White neck, ~16 inches long (40 cm), 2.5~3 inches (6 cm) in diameter, ~1.75 lbs. (800 grams) in weight. Best for late spring to early summer harvest. 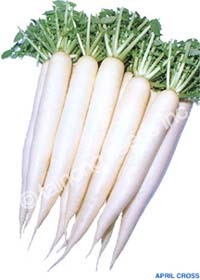 Excellent quality for cooking, pickling and salad. Easy to use; plug in water supply (hose) and standard electrical outlet.